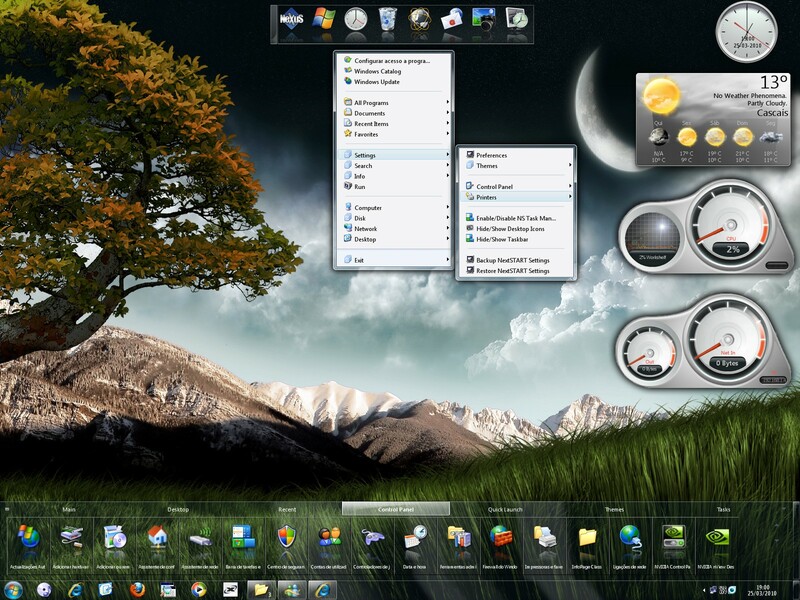 Winstep Forums :: View topic - Winstep releases Winstep Xtreme 7.4! Post subject: Winstep releases Winstep Xtreme 7.4! Winstep is proud to announce the release of Winstep Xtreme v7.4 Final. You can download the new Winstep Xtreme 7.4 version from HERE. Weather Forecast: the weather module now covers over 39,000 cities all around the world, and provides useful 5 day weather forecast based on Weather.com's data. Improved time-zone and location selection for cities within the US: the time zone information used by the weather module to decide when to display a moon or a sun icon is now more granular for US cities since it is now based on US State rather than shared by the whole country. Selecting a US city has also been made much easier by allowing you to specify the State to narrow the search. Improved localization for non-western countries: NextSTART tooltips previously had trouble displaying non-western text (Cyrillic, Japanese, Chinese, etc...) . The issue has been fixed in this release. One-click install theme packs: Winstep themes are now packed in the new .xtreme format. New themes can be automatically installed and applied simply by double-clicking on the downloaded theme file or immediately upon downloading from the Internet if you select 'Open' instead of 'Save' in your browser. Complete full screen game cooperation: Winstep Xtreme applications are now able to automatically detect when a full screen game or application is running and enter a special 'cooperation' mode where CPU usage is kept strictly at a minimum and any activity that might interfere with your game playing is avoided. Show running applications on docks: NeXuS docks can now display running tasks as thumbnails of the actual windows (or simply as icons, if you prefer). Tasks in docks can be re-ordered by simple drag & drop. In-dock Start Menu button: this is not exactly a new feature since it could be accomplished before, but, to make things easier, the default dock now comes with a Start Button item that opens the main NextSTART menu when clicked on. Improved Sound Scheme handling: WorkShelf now reverts to the default sound scheme when applying a theme that doesn't supply its own sound effect pack. New Internal Commands: added a 'Show/Hide Desktop Modules' to NextSTART so WorkShelf desktop modules can be quickly toggled into and from view through a NextSTART hotspot, 'Exit Winstep Xtreme' and 'Quick Exit Winstep Xtreme' internal commands that exit all currently running Winstep applications and a 'More Themes' internal command that opens the Winstep Themes page on your browser. Modern 'Glass' look: WorkShelf balloon tooltips and the small 'busy' dialog now pop up using an attractive and modern 'glass' style that blends in perfectly with the new Windows Vista. Bitmapped clock hands with shadow: the desktop clock module can now display the time using 'real to life' clock hands. Analog Gauges: the CPU, Net and RAM meters can now display data using an analog gauge format. The gauge needles can be either bitmaps (with optional shadow) or drawn by WorkShelf itself. Desktop Module Overlays: added the ability to specify an overlay bitmap to the CPU, Net and RAM meter desktop modules. New 24x24 icon size for menus: NextSTART menus can now display 24x24 icons, in addition to the previously available 16x16 and 32x32 sizes. There are literally hundreds of other additions and fixes in this awesome new release. You can see a complete list of changes to the WorkShelf and NeXuS component of Winstep Xtreme HERE and to the NextSTART component HERE.